Metal Plating Crystal generates the glass coating film specifically on metal plating parts. The product can be deployed of all metal plated parts such as car grills, door handles, trims and emblems. Since the hard protective glass coating film is created, it can prevent degradation and deterioration of those parts from happening and maintain them in deep glossy looks. The cars recently engage lots of metal plated parts. When those parts look dull, the entire image of a car will down. Also some car owners worry about having black metal plated window frames which can get whitened and dull easily. By applying the glass coating, a speed of deterioration will be totally different. Once you use Metal Plating Crystal, you will realize this is the must use product to maintain your car beauty. The glass coating film established by Metal Plating Crystal will never be oxidized and deteriorated. It continuously provides glossy looks with water repellent for 12 months by one application. Also the coating layer is extremely hard so that it firmly protects parts from scratches. Metal Plating Crystal is also ideal to be used after polishing parts with Metal Plating Polish. This product can be used for metal plating parts only. This product cannot be used for car painted body, plastics and rubbers. If this product is utilized while there are any dirt or contamination on surfaces, they cannot be removed after an application. 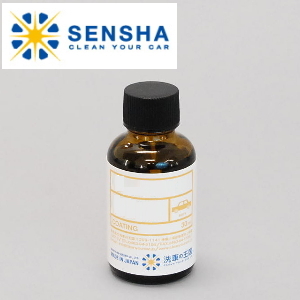 Please make sure to wash and clean surfaces before starting glass coating with this product. After an application, please wipe off the surfaces. Do not leave the application without wiping. Please avoid use at locations exposed to a hot sun or direct sunlight, or when surfaces are hot. This product is not for washing and cleaning any dirt and stains on metal plating parts. If you would like to remove any dirt, please follow the below steps; daily car wash: Body Clean; remove contamination such as paint mist: Clean Clay; remove dullness and scratches on metal plated parts: Metal Plating Polish. After the product is opened, it begins to harden due to contact with the air. It cannot be stored so be sure to dispose of excess solvent after work.